Last week they were having an Oktoberfest celebration at the Paulaner's restaurant in the Kempinski Hotel. It ran every evening from Tuesday night to Saturday night. I went on Wednesday night with some friends. Paulaner's had a really nice buffet of German food, and some good Oktoberfest beer they had brewed. They also had a band from Austria called Alpenrocker who played a mix of songs in German, some songs in English, and at least one song in Chinese. It was pretty fun, but it was very warm that day and for some reason the restaurant didn't have their air conditioners up very high. I was also pretty tired from the long work day, so I didn't stay too long. After lots and lots of good German food and two beers I decided to go home. I got home at about 10:30pm or so. There was a lot of lightning flashing around, and we had a really huge thunderstorm later that night that went on until about 4:30am or so. We have been having a lot of rain just about every night. On Friday night I went to Mooney's Pub at the Shangri-La hotel. The American Chamber of Commerce was having a TGIF Happy Hour party, and I thought I would go to represent IBM, since the people from the company who usually go tho these events could not go. Mooney's had a band from Australia called Peachy which was good. For a warmup act there was a very pretty Chinese girl who played some songs on an electronic fiddle. I ran into a bunch of friends there from the US, and a lot of what we talked about was football. It was a nice evening. On Saturday I went to visit my friend Reese and some of her family who are visiting Chengdu. Her mother and oldest sister, Hong Ping, had traveled from Hunan province to visit Reese and her sister Rena. Hong Ping is thinking of moving to Chengdu, and I think her mother would like to play matchmaker between the two of us. Lunch was a large variety of Hunan dishes made with pork and vegetables as well as a chicken dish. I ate too much so I didn't need to eat much for dinner that evening. Hong Ping is hoping that some day she can get a job translating books from English to Chinese. She can read very well, but needs some practice with her spoken English. The book she is currently reading is Jane Eyre which uses a lot of old English, and even I have trouble reading some of that. After lunch she read some of this to me. We also talked a little bit about Chinese writers, and she was very surprised that I had read works by Lao-Tzu and Zhuang Zi. It was an enjoyable afternoon, but I was a little tired since I got a support call from work early that morning and did not get as much sleep the night before as I had hoped. ...and I thought that's... strange. Why would the government of the United States, the country who has liberated more people from tyranny and oppression than any other country in the history of mankind, want to celebrate the 60th anniversary of a government that has oppressed and destroyed the lives of so many human beings? 1) Cars are still new to China and most drivers do not have much experience driving. On my first trip to China in 2001 everyone was on bicycles and there were only a few cars. Now it is the opposite. Of course, if you ask people if they can drive they will tell you they have been driving for a long time and are very experienced. 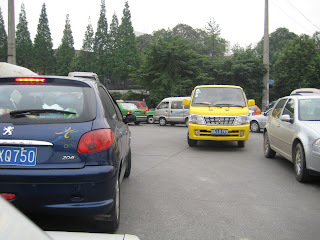 2) There are probably about 1,000 new drivers every day in Chengdu. That's just a guess, but I heard that Beijing sells about 2,000 to 3,000 brand new cars every single day, so 1,000 new drivers for Chengdu with a population of about 11 million people is not a bad guess. 3) A lot of these new drivers have no training, and many pay bribes to get their license. Corruption is bad everywhere here, and the Chinese version of the DMV is no exception. When I first looked into getting a driver's license here they only had the written test in Chinese, but I could hire an translator. There are two types of translators I could hire... one that would translate the questions for me, and one that would translate the questions for me and give me the answers. The second one is a little more expensive. Just about every person I have talked to that has gone through a driving class here has been encouraged to bribe their teachers with small gifts if they wish to pass. 4) Most Chinese drivers are rude and selfish. Selfish driving is the rule of the road here. Never let anyone else have the right away. Never let anyone pass you. If you have to stop somewhere be sure to stop where it will provide the most inconvenience to others around you. Do not pull off the road if you need to use your cell phone... Get into the left lane and slow down to 5 MPH while you chat on the phone. Heck, if you can drive down the divide between 2 lanes at 5 MPH then that is even better. This stuff about saving face is a load of BS too. I've heard people say they did not want to let someone pass them because they might lose face, but their actions to avoid this loss of face are shameful most of the times. For example, I've seen someone in a car almost run over some little old lady as she tries to walk across the street because they didn't want to let her go by first. Crazy. 5) Most Chinese people do not know how to wait in a queue. Traffic is basically a long queue of people who happen to be in (or on) vehicles. Although you will often hear that China has a civilization that has lasted for 4,000 years (or 5,000 years or 6,000 years, etc... depending on who you talk to) waiting in queues seems to be a civilized behavior they missed. Or else they knew about it, but forgot about it while Mao was in power. 6) Political elites are the worst offenders of traffic laws, and many other drivers emulate their bad driving behavior. If you are driving down the road and see a car with a red colored character on their license plates then you know they are high up in the government and are better than you. They are above the law. They also have a special sounding horn, and you better get out of the way if they honk it at you. Failure to do so could be reason enough for a trip to a labor camp for a few years. If one of these idiots hits you just go ahead and plead guilty. It's never their fault. 7) Chinese police do not enforce traffic laws. They do pull people over who have not paid their car tax, but that's about it. Want to drive down the sidewalk? Go for it! There are probably dozens of other reasons too, but I won't go over all of them here. You get the idea. It's not a very good picture, since I did not want to get out of the car to take it. We weren't moving, but that doesn't mean someone would not run me over if I stepped out of the car, especially the people on bikes, scooters and motorcycles that weave in and out of this mess. I will have to try to explain how traffic flows through this intersection... It is a 3-way intersection that comes off of an old bridge which goes from west to east. The bridge can support about 3 lanes of traffic (there are no lane markings on the bridge) and the other two roads which run north and south can support 3 to 4 lanes of traffic. There are lane markings on the north and south roads for one lane of auto traffic on each side as well as a lane for bicycles. Cars, trucks and buses use the bicycle lane whenever they want and bicycles, scooters, motorcycles, pull carts, etc... sometimes use the auto lanes if they can survive doing so. Lane markings are only guidelines... not rules. Up until yesterday there was no traffic lights at this intersection, and going through the intersection is a bit of luck and a bit of chaos since the concept of right-of-way is not really understood here. Sometimes someone has to stop to let traffic in one of the other roads of the intersection pass because the others have nudged in, and this is when the problems start. If someone in front of you stops to let other traffic go by you do not just stop and wait your turn (you do not know how to wait your turn in a queue, remember?)... you go around them using the bicycle path or even the lane for oncoming traffic. If there is a lot of traffic you can have a lot of lanes of traffic, since people will continue to go to the sides to go around the stopped traffic. Since you are not an experienced driver you did not look down the road to see that there are 3 lanes of traffic trying to squeeze into the one lane of oncoming traffic that you have now taken, and being a rude selfish driver you do not care. So now you will sit and wait for someone else to move. Although there are now traffic lights at this intersection it did not seem to help this morning. After all, traffic lights are like lane markings... only guidelines, not the rule. What is curious though is this... I've seen cars hit pedestrians, other cars, bicycles, etc... but I've never seen them hit a dog. Dogs seem to have some magical property that allows them to cross the street with no fear and no danger. It's weird.